Did you change oil brands/viscosity? Lower than 1 BAR is normal at hot idle, noted in manual IIRC, but should immediately rise upon accelerating, also noted IIRC. First verify oil level is fine. 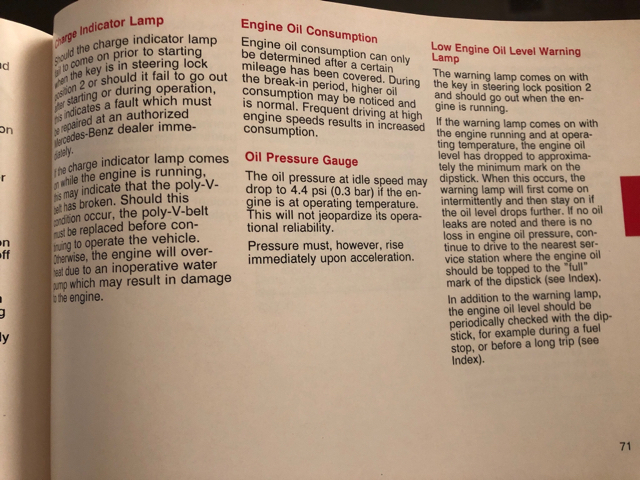 Time that happened to me was when gauge was leaking oil out from connection at the instrument cluster on the W123. Of course that time my wife was learning to drive and was wondering why it was getting slippery underneath in the footwell... Oil level was low and pressure wouldn’t rise up to maximum rapidly. Yup, I've seen the same. Mine hovers around .5bar at hot idle. Instantly rising with any throttle application. Pegs at 3bar under heavy accel and around 2.8/2.9 until light pressure. I'm not sure what causes the oil pressure on these engines when they age. Normal wear and lack of resistance in the worn surfaces through which the oil flows. Do you mean added resistance form the pump (which is at one end of the engine) to the other end where the filter and pressure sender is? Is the pump actually sitting in the front or way in the back? The chain is up front for sure. No. The oil pump located in the crankcase, picks up the crankcase oil and pumps it through the various oil galleys which include all the crankshaft bearings, camshaft bearings and valve lifters. The resistance through those closely machined parts is what determines the pressure. The gauge is just an indicator of the pressure to those very important parts that require lubrication to minimize wear, but they do wear. As they wear, more and more oil flows through those close fitting parts leaking back to the crankcase where the pump picks it up again and recirculates it. As the bearing surfaces wear the resistance offered when newly fitted, lessens. The pump also can wear but as long as the pressure required by any lifters exists, all is well, as long as there is 'some' uniform resistance throughout the pressurized system. Actually, volume of oil circulating is more important than pressure, except for engines with hydraulic valve lifters (as the diesels). OK, so the main issue must be the bearings (both crank/camshaft) letting more oil flow thru and the pump getting somewhat weaker as its moving parts must also wear causing some leak internal to the pump. I can not think of any other fitting that allows more flow in a significant way, but then again not too familiar with the bottom end of the engine. Curious, does the engine need to come out for the oil pump to be serviced? Sounds like it. I'm sitting at 1.5bar when hot at 195K miles, so probably OK for the time being, not too concerned, just curious. Replaced my power steering pump and aux fan. I have a new hatred for Benz engineers. Should have just removed everything, radiator, condenser etc but that seemed excessive.....it wasn't. Car has 228K on it now. The head gasket was replaced 19 yrs ago at 118K, but I’m not sure if it was the reinforced one. Myself and the previous owner both only used Zerex G05, so I figured it’s just more of an age thing. I think the local machine shop has a freshly machined 89 2.6 cylinder head for sale, so I’ll pick that up. Going to order an Elring head gasket set, plus replace the water pump, belt tensioner and fuel injectors while I have it apart.